Empower your organization with low-code apps to streamline processes. Blockchain has evolved from its sole use for immutable ledgers in finance to a wide variety of use cases involving transactions such as transparent supply chain management, shipping and logistics, and even music royalties. With so many new and disruptive uses emerging, businesses need to adopt blockchain, and do so quickly and efficiently—this will be a key step in digital transformation. TIBCO Cloud™ Live Apps, a low-code application development platform, allows businesses to do that and much more. Blockchain platforms currently do not provide any graphical design-time tooling, but with the visual modeling in Live Apps, adoption of blockchain solutions for new or existing systems is streamlined. Further, Live Apps is a great addition to blockchain technology because it provides an easy, fast, and iterative approach to creating process applications. 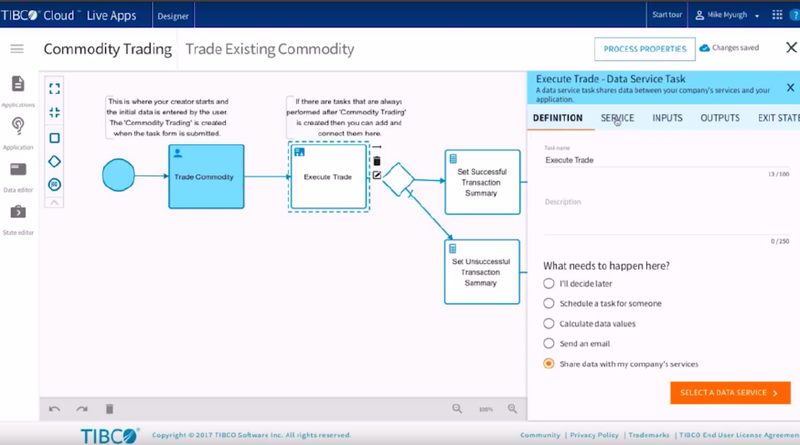 Watch as TIBCO Cloud Live Apps is used to create a blockchain-based property title management application to answer business needs. A technical team can create a property business blockchain network and expose the blockchain application services as building blocks available in Live Apps process designer. This means executing transactions on the blockchain network from a process digitized with proper rules and access control within Live Apps. Staff is then equipped to optimize existing operations and cover new scenarios, allowing for quick decisions and swift actions.